David and Kathy are both children of missionaries. David grew up in India where his father was an evangelist and Kathy grew up in Indonesia. David and Kathy met during Bible college at Columbia Bible College in South Carolina. This is where God called them both individually and then together to a life of bringing the gospel to the dark parts of the world through a church planting ministry. 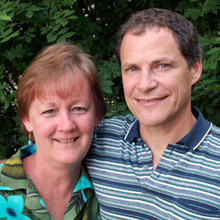 David and Kathy have been planting churches in needy cities of the Philippines since 1986. The people of Cebu are friendly, and generally welcoming people. They are steeped in the Catholic religion, specially in their worship of Mary and the “Sto Nino,” an image of a child that is their pride and focus of their annual festival know as the Sinulog. Due to their devotion, they are difficult to reach with the message of Jesus Christ alone. Yet God is opening more and more to understand and put their faith in Christ. That God will break down the hold of idolatry in their lives and open up their hearts to embrace Jesus Christ as the only true Savior and to be willing to step out from the traditions and follow Jesus Christ.